IUF UK affiliate Unite is campaigning in response to the announced destruction of 900 jobs across Scotland by transnational drinks company Diageo. Diageo, whose spirits, beer and wine brands include Smirnoff, Johnnie Walker, Captain Morgan, Baileys, J&B, José Cuervo, Tanqueray, Guinness, Crown Royal, Beaulieu Vineyard and Sterling Vineyards wines, and Bushmills Irish whiskey, is hugely profitable, with rising sales and margins by all its leading brands. Total profits for 2008 were over 3.6 billion USD, the company spent nearly 1.5 billion buying back its own shares and the CEO pocketed over USD 8.2 million in pay. No employee shall suffer harassment, physical or mental punishment, or other form of abuse. Since the Lipton Khanewal workers formed their Action Committee to fight for their rights, members have been denied work, demoted and pushed into even deeper poverty in an attempt to break their resistance. At the same time, some 100 new contract workers - with no experience, skills, or seniority (over 20% of the workforce) have been taken on in the midst of what the company contends is a production downturn… but is clearly a show of force to weaken the Action Committee and the IUF. Carlos Reyes, General Secretary of IUF-affiliated Stibys (the industry, drinks and allied workers union) and member of the the IUF World Executive Committee, was beaten and hospitalized with a broken arm. Never has the disconnect between finance and the world of work been bigger, nor profit more deceptive. While workers are experiencing rising unemployment and falls in output not seen since the Great Depresssion. Wall Street and global stock exchanges have detected more "green shoots of recovery" in the latest quarterly reports from the US banking sector. "Our People Vitality programme aims to enhance the personal well-being and effectiveness of our people, through advice on exercise, nutrition and mental resilience. During 2008 the programme was rolled out to our operations in Asia, Africa and Latin America. The programme is already showing positive results. Participants have reported improvements in their quality of sleep, energy levels, motivation and work performance." On 25 February, the Council of Ministers in Burkina Faso authorized the government to ratify the ILO Conventions 183 on Maternity Protection and 184 on Health and Safety in Agriculture. The five IUF-affiliated unions in Burkina Faso have worked actively to promote the ratification of these conventions in the framework of an IUF/ILO supported health and safety program and the IUF regional Women’s project. 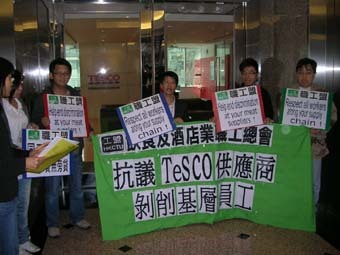 The Hong Kong Confederation of Trade Unions and the IUF affiliated Catering and Hotel Industries Employees General Union (CHIEGU) have joined unions supporting the T&G section of the UK's Unite campaign for equal treatment for meat workers employed in the UK and Ireland in transnational retail giant Tesco's supply chain.